This cemetery is located in Harris County, Georgia. It is located approx. one mile from Exit 30 of I-185. From Exit 30 on Interstate 185 go west to GA Hwy 219. Turn north on GA 219 to the first paved road on the left (Pine Lake Rd.) 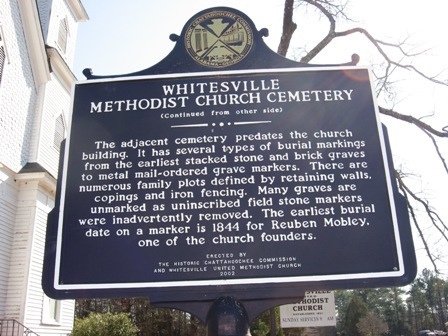 Whitesville UM Church will be the first church on the right. The Old Section of the cemetery is on the right, next to the church. The new section is on the left, across the road from the old section. Information about this cemetery and those buried in it can be obtained from me, phone and e-mail listed above. The old section of the cemetery has many field stone graves. Many graves are no longer marked. Many field stone markers were removed when a contractor was hired to cut the grass. Not knowing these stones marked the graves, the stones were removed to prevent the grass mowers from hitting them with their blades. Photo used with permission, courtesy of Norman Satterwhite, www.findagrave.com, 5/19/2009.